When living in the coastal town like Boca Raton, we’re often times faced with trying to find a hair color that matches our summer skin tones. Whether you’re an avid tanner, or you walk first thing in the morning it doesn’t take long for the sun to take its toll and changing your facial features. There are many hair trends with combinations of anything from wild colors in natural hues. It can be overwhelming trying to find just the right shade that’s ideal for you and your lifestyle. This blog will help you to have a deeper discussion with your colorist once you are on the quest of picking just the right shade. Summer of 2015 the color trends were leaning towards Ombre styles. This method of coloring the hair with either lighter or darker ends keeping the roots the opposite shade is still popular. However, there are varying styles including watermelon hair to mermaid hair. These newer shades are gorgeous across the board as you have a full spectrum of variations. Opal and Pinks look hot for people with pale skin tones or fair, but with a tan these could make you look like ‘Rainbow Brite’ which may wash you out. Prior to selecting one of these pastels, consult with your hairdresser in selecting the right shade. Often times these shades require extra maintenance and can be a lot of upkeep. Take into consideration if these are the right choices for you, especially if you work in a conservative field. 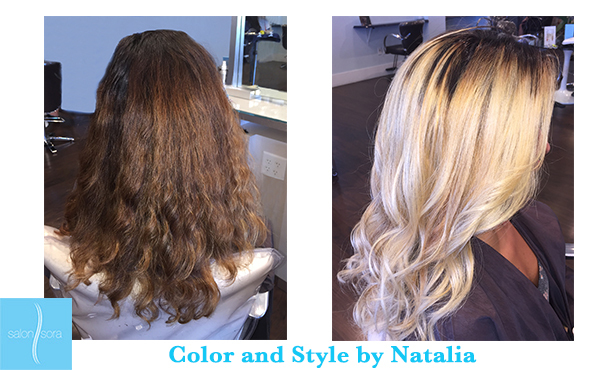 Another chic look is that of Balayage where color is applied freehand rather than using traditional foil or having strands pulled through a cap. This look tends to be very natural and is relatively low maintenance. No matter what is the length of your hair Balayage is ideal and looks stunning on almost anyone. Strawberry blonde’s and redheads are making a comeback, since Christina Aguilera traded in her platinum for a fiery red. Consider blending both strawberry blonde with darker shades of copper and brown for a more natural look. Silver and gold seem to be taking the place of the platinum blonde’s everywhere. There are a variety of applications with these two hues in this color variation looks incredible against tan skin. If you are a natural blonde, consider having lavender and gray streaks assembled through your hair for a state-of-the-art appearance. For Asian and Latina women the Silver Fox is sweeping the nation. If you are considering this style keep in mind this is going to be a bit longer process. This is also more attractive to women with longer locks, as the shorter hairstyles resemble hair that’s aged and that’s not the look we’re going for. Blue and Aberdeen create a fun and party look that tends to be sought after by younger women. Darker haired tones, such as black and brunette tend to pull this style off the best. Metallic shades such as white platinum are a newer version of blonde where there are darker shades on top that blend into an ash blonde at the bottom. This is a gorgeous combination and looks beautiful pulled back into a pony or long and flowing with curls. Whether you’re trying a new color for the first time or you want to update the one you have, ask the stylists for their expert advice. Summertime is the best time for changing your color and we’re here to help. We are the ‘Best Salon’ in Boca Raton!